You need to build an email list as soon as possible! How many times have you read this statement or heard it from coaches, influencers, and entrepreneurs? I bet many, many times. You know that email list building is crucial to success, but how to do you actually do it? Especially if you’re a newbie blogger or solopreneur? 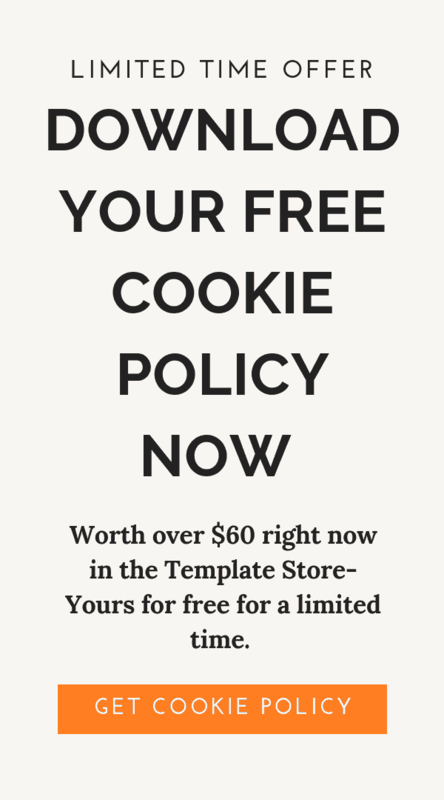 Are there any quick email list building tactics that you can implement? 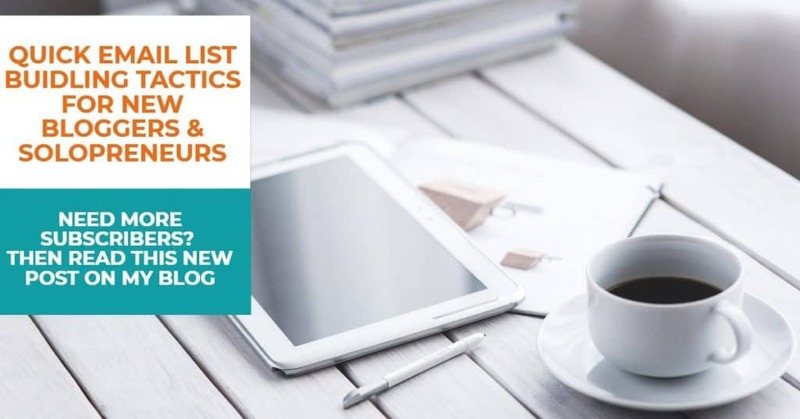 The email list building tactics that work for established bloggers and solopreneurs might not necessarily work for you. This is because you don’t have traffic yet, you don’t have credibility or recognition yet. Moreover, you don’t have a whole lot of content to even attract people to your site. 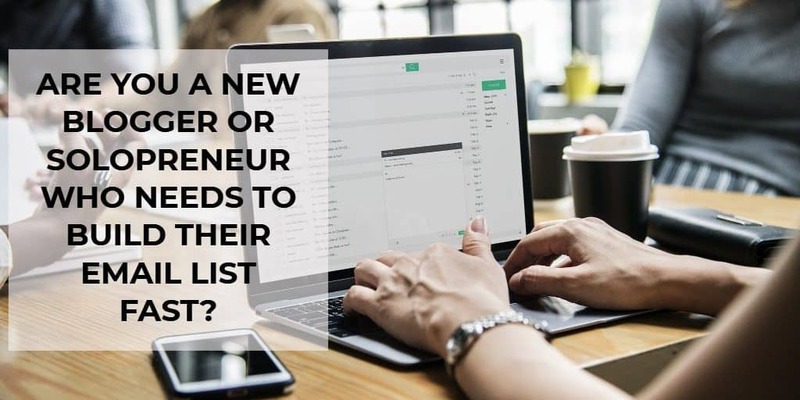 So where do you begin to build your email list as a newbie blogger or solopreneur? When you’re a new blogger or solopreneur, chances are that you haven’t yet figured out what services or software to use. Moreover, you most likely have some financial limitations on you in the sense that you can’t spend a lot of money on many different programs. At this stage, you’re still trying to build yourself up to earn money. For this reason, I am going to recommend some services and products for you to go with. Yes, I am affiliated with some of them, and will receive a small commission at no expense to you if you decide to make a purchase through my links. I would be very grateful for this. Any email list building tactics start with having a reliable email service provider. The provider you choose should be one that will allow you to scale up if necessary, and support your future growth. In my opinion, it’s better to pick a provide and stick with one, rather than switch halfway through. Transferring lists, subscribers, tags, your preexisting templates is a long and tedious process. You want to avoid this as much as possible. What makes a great email service provider? What are some features that you should be looking for when deciding who to go with? After all, there are hundreds of email service providers out there today. There are certain things that you should absolutely have in your email service, especially if your goal is to grow, sell things, make money, etc. I am not gonna go into detail today as far as what each of these features are. If you want a detailed post or video on specific features or programs, let me know in the comments. I am currently using ActiveCampaign and it quickly became my most favorite platform for email list building and marketing. ActiveCampaign has numerous options and features that will allow your business/blog to grow as high as you want. I came to a point in my blogging, where I wanted more automation features and capabilities, and wanted to be able to segment my subscribers as much as possible. I did my research, and ended up doing free trials for Drip and ActiveCampaign. Initially I was drawn to Drip. It just looks beautiful, it’s sleek, and definitely has many features that I love. But, I found automations to be complicated in Drip, and visually it was not intuitive for me. Alright, since this not a review post, I will just say that I fell in love with ActiveCampaign, their support and knowledge base, and signed with them. If you want to see if ActiveCampaign is for you, you can use my link to get 14-day free trial without credit card information: Learn about ActiveCampaign. CovnertKit is an email service provider that was created with bloggers in mind. The platform is extremely easy to use. All the features are simple to understand. Delivering a lead magnet in CovertKit is the easiest and fastest way to do it. The price is on the higher end. Also, even though ConvertKit has automations and rules, they can be a little too simple sometimes. I do think for starting out ConvertKit is great. I myself used it and love it. If you want to check out ConvertKit, you can use my link: Learn about ConvertKit. From my personal experience, the lead capture forms and options that are integrated with most email service providers are not as advanced or pretty as the stand alone lead captures, such as Thrive Leads, Convert Pro, Sumo, OptinMonster, etc. These lead capture plug-ins allow you to design and customize your popups, inline forms, scroll mats, etc. I love all the ones I mentioned. The one that has the most features and capabilities in my opinion is Thrive Leads. ConvertPro is equally amazing as it gives you the most customization out of them all. You can literally chance anything on ConvertPro. If you’re new in the field, and are just starting out, most likely you don’t have any personal or blogging reputation. This also means that you don’t have big or any following. You’re not an influencer and you don’t have any important connections. I know, this was despressing. However, knowing and accepting this will allow you to focus your energies where you actually have a chance of gaining some exposure. You can sit behind your computer all day and message thousands of influencers and ask for retweet or share or like on your posts. However, the reality is that these influencers aren’t gonna pay attention to you. Maybe, one out of a thousand might respond to you if you’re very lucky. But this is not a guarantee. So as a new blogger, what email list building tactics can you employ? Creating your lead magnet holds true for everybody. Whether you’re a seasoned pro with a stable site, or a complete beginner, if you want to get subscribers and leads, you should create your lead magnet. A lead magnet is a resource that you create and offer for free (in rare cases you can sell it at a discounted price, but I don’t recommend this). This resource can be anything: e-book, guide, checklist, cheat-sheet, discount code, coupon, online course, email course, templates, etc. You offer this resource to your readers in exchange for their emails basically. Your lead magnet should be valuable to your readers. They must perceive value and usefulness for themselves in order to give you their emails. Think of this process as bartering or exchange. You need to give something to get something. Your lead magnet should look attractive and professional. If you have an eye for design, you can create very beautiful looking lead magnets and cover pages with Canva, Photoshop, InDesign, and even Power Point and Google Docs. If, however, you struggle with graphic creation, design and using the programs listed above, then maybe consider hiring someone to help you with this task. UpWork and Fiverr, and 99 Designs are all great places to find talented individuals to help you. You can even get a ready made templates for different lead magnets from sites like Creative Market. Ok, so far we’re discussing the basics for list building. In other words what you have to do to prepare your website to capture leads and build your list. Your next task is to place optins such as popups, inline optins, after post optin, etc. Your homepage should definitely be one of the places where you have these optins. Make your lead magnet offer prominent so that people will see if upon visiting your site. Aside form the homepage, you should also have optins on your popular pages. The way to determine which posts/pages are the most popular is to go to your Google Analytics, select Behavior tab, then Site Content, and then select the option that says “All Pages.” This will open a list of your content and you will be able to see which one are your most popular pages and posts. Once you have this information, go back and strategically place popups on those pages. Moreover, if you have blog posts that are popular and generating traffic for your site, should do content upgrades, and place them on those popular blog post pages. What does having a strategy for email list building tact entail? It means that you should have a plane of starting point, then moving to the middle, then to the end. Each one of these points should be clearly defined and stated for yourself. Therefore, especially as a new blogger or solopreneur, you should have a plan and strategy when it comes to email list building tactics. When you’re better known, you have established a reputation, people will start opting in based on your name and reputation alone. However, this won’t happen initially. So you have an email service provider, a lead capture tool, you’ve created your freebies, and strategically placed your optin forms on your website. At this point, you have to do something that will bring the most subscribers. A great way to get subscribers fast is by doing a giveaway. Several tools exist to help you with your giveaway, both free and paid. One of the free versions is the King Sumo app, which helps you organize a giveaway on blog or social media profiles. You’ve most definitely seen a giveaway before even if you never participated to one. Generally, there is a prize that is being offered, and people have to take certain steps to be eligible to win that prize. Those steps can be things like subscribing to your blog, email list, liking your Facebook page, following on Twitter, sharing your giveaway on their social profiles, etc. Giveaway involves a prize. The trick to a successful giveaway for email list building is to target your audience. This means that first you need to do research to determine who your ideal client or buyer is. When you determine this, your task becomes little bit easier now because you can learn and find out what interests your target audience and what they’re looking for. Therefore, when you market or promote, you can do this with them in mind, resulting in higher conversions. What this means is that you have to be mindful of the prize you’re offering for your viral giveaway. It has to be something that appeals to your target audience, and not necessarily to the population at large. You don’t want to give away a camera, or an iPad, a laptop…You get the picture. Those are all things that everybody would love to get for free. If everybody signs up for the prize, sure, you’ll have a lot of subscribers. However, in list building quality of your subscriber is more important than the quantity. You can have 1000s of subscribers, but they may not care about your niche or what you’re selling. This means they will not buy from you. On the other hand, if you offer something that mainly your target audience is interested in, then your subscribers will consist of your perfect buyers. Even if you have a list of only 200 people, majority of those 200 will buy from you if you market your services correctly. Thus, yielding more revenue than 1000s of uninterested subscribers. If you’re gonna go through the trouble of organizing a giveaway and finding a prize, etc. then you should do everything in your power to make sure that you’re maximizing your reach and getting to your target audience. Promoting on your social media is a great place to start. Prepare a few social media messages with pictures and links to your giveaway, put it on auto mode, so that you keep having announcements posted on your sites. Reach out to your friends, and have them share your giveaway and invite their friends if they thinks their friends would be interested in the topic. (Again remember, quantity over quality of a subscriber). Promoting your giveaway on your social media profiles and those of your friends is great. But, it’s not enough. You’re trying to gain more and new exposure. In other words, your goal is to reach people that you haven’t yet. For this reason, you should plan several Facebook Live appearances leading up to your giveaway. Remember that you don’t want to be talking about only the giveaway. Mention it, have a link to it, write about it in the description. However, you want to appear personable, approachable, and want to give your target audience a reason to want to subscribe. This is the time to connect with your ideal buyer. Tell a story, figure out a problem, and give a solution. Solidify yourself as someone your ideal buyer can trust and follow. Facebook Live and Instagram Live are both great mediums for reaching new audiences. Use this feature. Moreover, aside from the giveaway, your Facebook and Instagram lives can be places to collect leads. Many email service providers, including ActiveCampaign and ConvertKit, have forms that you can share with a link. This is a great opportunity to place the link on your social profile, on blog or business page, then have a call to action where you direct people to click on that link and sign up. That way you will have their email addresses even while you’re doing your live. Up to now, whatever tactics we discussed, you could do them for free. However, spending some money just might be the push that you need to propel your forward. I said that his section is optional because it depends on your financial situation. If you can afford to spend anywhere from $60-$100 every other month and do Facebook ads by selecting your ideal buyer, then you will obviously be in a much better shape than without it. You can drive more leads to your opt-in form, and therefore have more subscribers. If, however, money is tight, and you absolutely cannot invest any in paid ads, then make sure you keep up your Facebook Live, Instagram Live appearances, and grow your email list organically. Email list building is essential for all the businesses, but especially those that are based on online, such as blogs and other online ventures. As a new blogger or solopreneur, building an email list can be challenging. The methods discussed today are by no means the only ones. There are multiple other methods and you just have to pick and choose to see which one works best for you. The particular methods discussed in this post work well for many people. Is there a particular method that you used? What was the most successful method for you? Leave your comments below. this is Kashif Latif and I am new in this field I want to ask you how can make an email list hope you will give me a reasonable answer because I am new in this field and want to learn please send me suggestion how can I make an email list. Hey Kashif! Thanks for your comment. I, unfortunately, cannot get back to you over email right now and give you all the methods for list building, as it’s an extensive list. However, this post that you commented under lists some methods that work very well for beginners. You can also take some online courses, listen to a few podcasts on the subject. If you want to be kept in the loop, you can also subscribe to my email list so that you get updates. I have a free resource on my home page, Email Templates, that you can use in your email list building and marketing journey. If you click to get it, I will also add you to my list. Really great ideas. How frequently would you recommend doing Facebook Live videos during a giveaway campaign? Thanks so much for the post! Hi Ben. Thanks so much for stopping by. I would say once a day definitely on both Facebook Live and Instagram Live. If you do it less often, many people will miss it because Facebook will push it down and it’ll get lost in other posts. Also, try cross-posting. You do Facebook Live, then tell your Instagram peeps about it “Hey, did you see this video I did on Facebook?” and vice versa. Bookmarked this one. I really need to work on my email marketing. I have to learn more about it as there are some terms which I do not understand very well. Thank you for sharing. Hi Sharon! Thanks so much for stopping by and commenting. If you need help with any of these, feel free to message me. I’ll be happy to help you in any way I can. Can’t tell you badly I needed to read this. Saving for reference so that I can come back again, again. Thanks so much for putting something so helpful together! Thanks for sharing. This is something I’ve been struggling with and appreciate the info! You’re welcome Kelly! I am glad the post was useful. 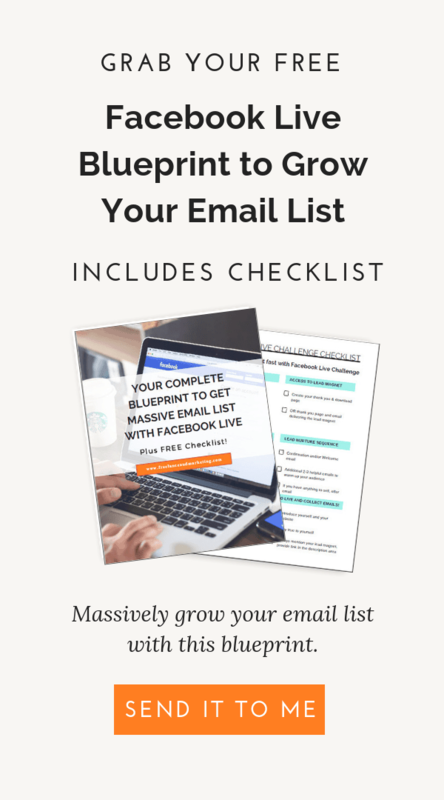 I’m struggling with growing my email list and I found some very useful tips from this post. Thanks for sharing them with us.